The focus of this meal was colours. 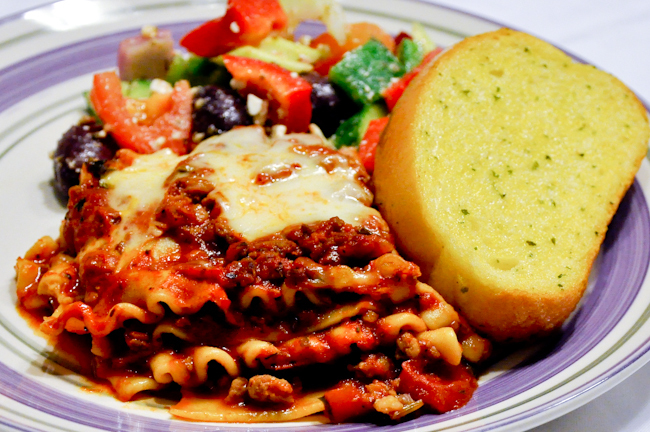 The main course of lasagna carried out the bold red which caught Glee’s attention. I paired it with the Greek Salad to incorporate the rest of the rainbow colours. The results were just amazing; not only Glee got to review her colours, but loved eating the meal too. She was super happy to have her auntie Gwei Mui as company and it was great that the adults enjoyed the meal too! Don’t be overwhelmed by the amount of ingredients in this recipe. They are not hard to prepare or super special in any way. You may notice that there are 10 servings for the meat sauce, because the meat sauce is also used for the Spaghetti with Meat Sauce later in the week. You can prepare the meat sauce in advance and freeze them in individual portions and they are good for several weeks. You can use the slow cooker for the simmering process. Just set it on low for 4-6 hours. Salad can also be prepared the night before to chill until ready to be eaten. Below is the detailed shopping list. Have fun shopping and we hope you and your family will enjoy the meals as much as our family did. Here’s a list of things you might already have in your pantry. Please double check so you can avoid stopping at the grocery more than once. Celebrating Over 2000 Hits A Day!! We broke the record for number of hits per day on GG again! We got over 2500 visitors on Thanksgiving Day! Thank you everyone for all your support! Keep coming back we will post more yummy recipes! Curry reminds me of India and the time when Huan and I first dated. Back then he worked for a bank and he had to travel for work a couple times a year. Most of his trips were a week here and there to New York or somewhere close. One time he was sent to India for three weeks. It might sound like nothing now, but for a new couple who just got together it felt like an eternity. We were together for less than three months at the time. We would spend most of our nights together in my little apartment cooking and watching DVDs while cuddling up in a warm blanket. While he was gone, nights became really lonely especially when I lived on my own. Thank god for emails and internet, we were able to communicate quite effectively even when he was half way around the world. There is a saying “Distance makes the hearts grow fonder!” I can truly say that I’ve experienced it! I would spend my nights under the same blanket writing him so that he would have something to read when he was done work. I would then wake up to a love email from him. It was one of the most romantic things I’ve ever done in my life. Up until today, I still have a copy of those love emails and from time to time we would make curry and cuddle up to read them together to bring back the fond memories and remind each other of what we have together. Curry powder contains curcumin, a powerful antioxidant and has an anti-inflammatory agent that helps to reduce inflammation of the joints. It is known to be helpful for people suffering from arthritis, especially ones who are allergic to synthetic drugs. The best aspect of the spice is that it is a side-effect free solution to your pain. Curcumin is also believed to deactivate genes responsible for triggering breast cancer. It is also effective against slowing down prostate and colorectal cancers. Regular consumption of curry powder helps to stabilize pancreatic cancer. Curry powder is rich in turmeric, a medicinally potent spice; it helps to fight against skin cancer. 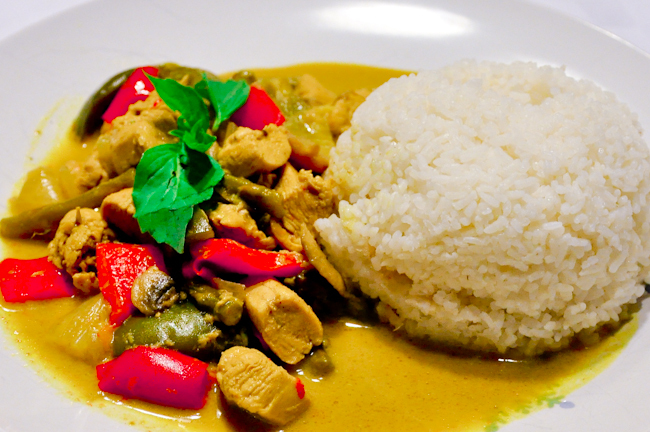 Consuming curry on an everyday basis is known to boost memory. Curry powder helps to treat several sexually transmitted diseases, including gonorrhea and chlamydia. Because of its anti-ageing properties, it is used extensively to fight skin ageing. It is also extensively used to treat skin burns and cuts. 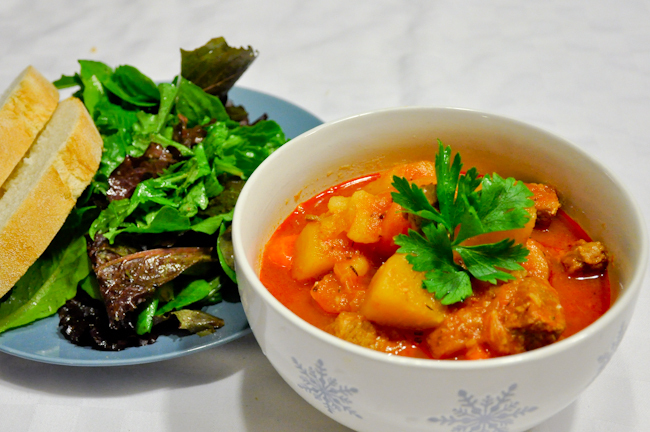 Curry is believed to fight Alzheimer’s disease. One of the major causes of Alzheimers is a plaque that debilitates the victims. Curcumin effectively blocks Alzheimer causing plaque, subsequently protecting the brain. This is a very flexible recipe. You can replace the chicken with firm tofu and turn it into a vegetarian meal. It will also go well with beef as well. The vegetables can be easily substituted with your family’s favourites. This is my first time using rutabaga. I always saw it in supermarkets and didn’t know what it was. Until I got this beef stew recipe, I was really anxious to try it. I found out that rutabaga is a root vegetable. when I was a kid I was always wondering how people discovered root vegetables in the first place. I mean they are not obvious as the root is underneath the soil. I remembered asking my parents this exact question many years ago. They told me a story about the hardship they went through during Khmer Rouge. It was a horrible genocidal event that happened in Cambodia between 1976-1979. Over 2 million people were killed and they were lucky to have survived such a near death event. They were striped of freedom and forced to work in the rice fields for the government. Food was only given to them if there were any leftovers from the harvest. In other words, they were always hungry and had to look everywhere for edible things. My father told me that he ate tree bark and plenty of roots just to survive. He said I am sure that was how people discovered root vegetables! After hearing the story, I felt really sad and scared at the same time. The reason was because I thought events like this were ancient history. I couldn’t believe how recent it was and my parents still came out this positive. I couldn’t believe a simple root vegetable question has helped me dig up so much family history. This just goes to show that you really can’t judge a book by its cover. Just like the root vegetables, you can never tell what you are going to get underneath. Regular consumption of rutabaga increases milk production capacity, stamina and digestion. Being an excellent source of vitamin C, rutabaga helps in reducing wheezing in asthma patients. Lack of vitamin C results in scurvy, which causes easy bruising. Consuming rutabaga considerably reduces the incidence of bruising. Rutabagas are also known to reduce the risk of cataract formation and support the structure of capillaries. An excellent source of potassium, rutabaga helps in decreasing stroke mortality. Potassium is also known to lower high blood pressure. They are also recommended for people with problems of constipation. You can just use any type of root vegetables. To save time, just chop them in advance. This stew is also great for freezing, don’t forget to freeze it individually. 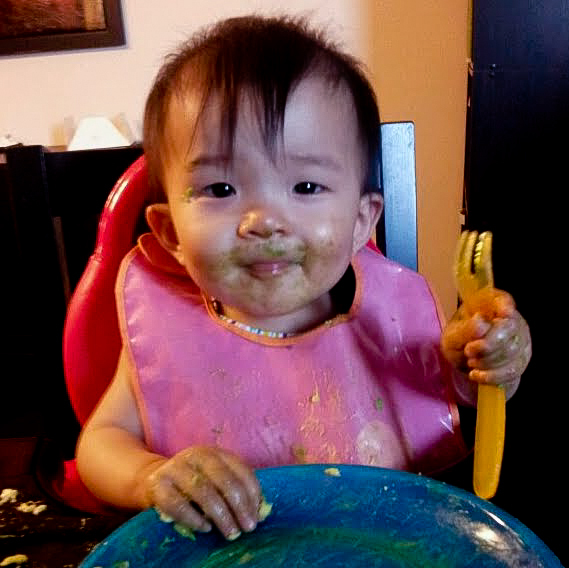 When Glee started solid food, avocados were one of the first few foods I gave her. I chose avocado because it is packed with nutrients, so for a growing baby it was perfect. It was soft enough for Glee to chew with her gums and you don’t need a lot of it to get the same nutrients as other foods. 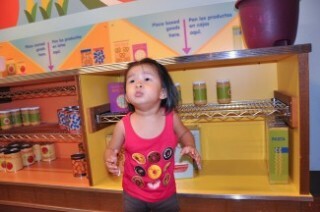 The fact that Glee could practice her motor skills trying to grab a slippery slice was just a bonus. She would try to poke it with a fork, then her fingers and make a mess as you can see from the above photo. 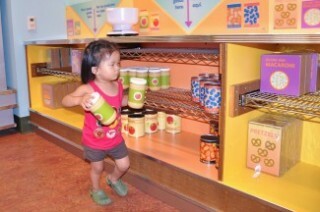 Actually this picture served as one of the inspiration pieces for Gleeful Gourmets’ logo. I loved how happy she looked with food! Can you see any elements taken from this photo in GG’s logo? 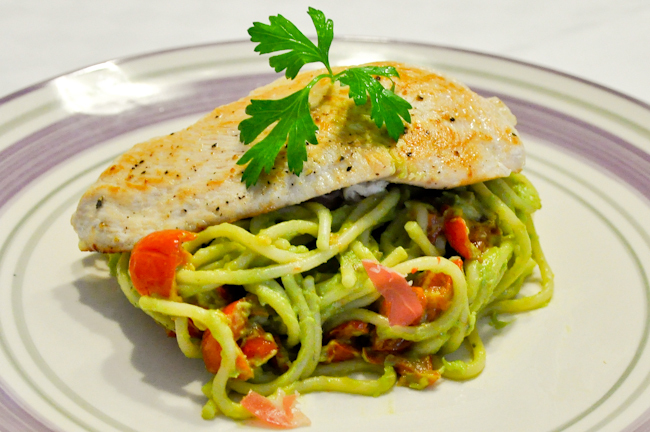 This creamy avocado pasta with chicken breast became Glee’s absolute favourite meal. Especially when I use spaghetti because she can never get enough noodles! Avocado paste, if applied to rashes and rough skin, makes the skin smoother. Being rich in magnesium, an avocado helps produce energy and is good for muscle contraction and relaxation. Avocados have been found to be helpful in lowering cholesterol levels, mainly because of the presence of beta-sitosterol. Consumption of avocados is good for those suffering from psoriasis and bad breath. Being rich in vitamin C and vitamin E, both of them having antioxidant properties, avocados help in slowing down the aging process. Cutting and rubbing the flesh of a ripe avocado on sun-burnt skin helps in soothing it. Glutathione, present in avocados, acts as an antioxidant and helps neutralize free radicals that can cause cell damage and lead to diseases. Since an avocado is rich in monounsaturated fats, it helps lower LDL (bad) cholesterol and boost HDL (good) cholesterol. Avocado is good for people suffering from digestive and circulatory problems. The potassium in avocados helps keep the body’s electrolytes in balance. The presence of folate in avocados promotes healthy cell and tissue development. Avocados have been found to offer protection against heart disease as well as various forms of cancer. The presence of Lutein in an avocado makes it act as a protection against muscular degeneration and eye diseases like cataract. If you like sundried tomatoes, you can replace the cherry tomatoes and save yourself the baking time. Over the last weekend, I attended a wedding dinner party and one of the conversationa was about a salad spinner. The debate was whether it was a useful tool?! I know most Asians don’t find it useful because they simply don’t eat a lot of fresh salad. I remembered having a conversation with my uncle when I lived in Cambodia a few years back. I made him a steak dinner with a fresh salad. He wasn’t used to eating uncooked vegetables because of his mental block from the past. He told me that back then it was hard to find safe drinking water, so they had to cook everything before putting it in their mouth including water. In the modern days, in most parts of the world drinking water is so accessible that we sometimes take it for granted. We need to constantly remind ourselves to look around, appreciate and be grateful of all the things we have, especially when we are having a bad day! This explained why I only remembered having cooked spinach as a child. 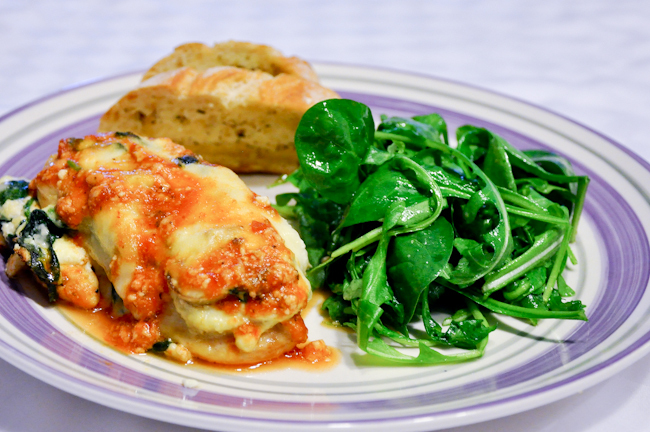 In this meal, I incorporated both cooked and fresh spinach because spinach has a lot of health benefits as listed below. The fresh spinach was mixed into the arugula and you definitely need to use the salad spinner to spin the spinach after washing it. Otherwise water will cling to the leaves and your dressing will be watery. Spin your salad and you will notice the world of difference! Spinach is very rich in Vitamin A, which makes it beneficial for weak eyes. Any kind of strain on the eyes is reduced to a great extent and the eye muscles are made stronger. The thickening and hardening of arteries is prevented due to substances like choline and inositol, which are present in significant amounts to make sure the blood arteries remain healthy. Diabetics can particularly benefit from spinach since it is known that eating spinach regularly can stabilize blood sugar and prevent it from fluctuating often. A particular substance known as flavonoid is present in spinach which is a powerful anti-oxidant and also has anti-cancer agents like carotenoid, preventing the formation of tumors. Spinach is known to be an anti-aging vegetable and reverses age related breakdowns, making you look youthful and fresh. It also has a good amount of Vitamin K which helps in the clotting of blood in case of injury. 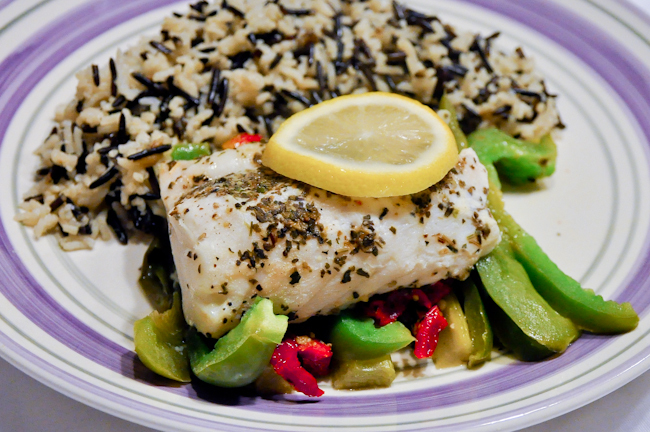 Go Wild With Wild Rice! The first time I encountered wild rice was through my husbands second cousin, Toan. At that time, he just moved into town as a dance student. To thank us for helping him find a place and settle in, he offered to cook us dinner. He made a baked fish with wild rice and shrimp tempura as appetizer. I was so intrigued by the wild rice that I don’t remember the fish. All I remembered was that the meal was not only healthy but very impressive. He even went to the extent in making his own multi-grain bread. From that day on, wild rice was one of my favourite grains. It is beautiful in colour with great texture, and best of all it is better for you than almost any other rice. I know it can be expensive compared to other types of rice; that’s why I usually mix it with brown and red rice. So go wild with wild rice as the possibilities are endless! Toan has ventured out to China a few years back. I can’t wait to see him again and I hope that I will be luck enough to get to taste one of his yummy meals in the near future. Wild rice is high in protein, the amino acid lysine and dietary fiber, and low in fat. Like true rice, it does not contain gluten. It is also a good source of certain minerals and B vitamins. One cup of cooked wild rice provides 5% or more of the daily value of thiamin, riboflavin, iron, and potassium; 10% or more of the daily value of niacin, b6, folate, magnesium, phosphorus; 15% of zinc; and over 20% of manganese. You can prepare the fish by wrapping them in foil and keep in the refrigerator the night before and when it comes to dinner time, just pop them in the oven. Happy Thanksgiving to all my United States friends! This week is Thanksgiving in the United States. I just want to wish everyone a very happy Thanksgiving and have a wonderful and safe Black Friday shopping day! If you are planning a turkey dinner, give our no butter Thanksgiving Meal Plans a try! I promise you won’t be disappointed! I’ve picked an ingredient from each meal and give you a list of food facts as to why they are good for you. I believe with better knowledge with foods, we can all make healthier choices. Athens Greece is one of the places that I want to visit but haven’t had a chance yet. Actually Europe is the continent I would really like to explore. I remembered going on a Europe trip with my parents and sisters back in 2006. It was a great trip as we got to see all the popular places, London, Paris, Italy, Switzerland and Germany in 10 days. I would recommend a trip like that for first timers to Europe because you get a sample of what it has to offer and decide which places you want to come back to. In the movies, Europe always gave me the impression of romance. I always thought that it was the “Hollywood” effect to make better movies. When I was there in person, it felt surreal because it felt exactly like the movies. Everywhere I looked there were something unique, like almost all the streets were interlocked and all the buildings and houses had their own characters and history behind it. I loved sitting on the bench and just watch people walk by, because everyone cared about fashion. I came from a fashion design background, so to see how everyone had a flare without being overly done up made my day! On top of that, people there seemed much more relaxed and of course the foods there were just so different! I can’t wait to get back there soon, but meanwhile I shall explore the Europe cuisines to tide me over my travel itch! 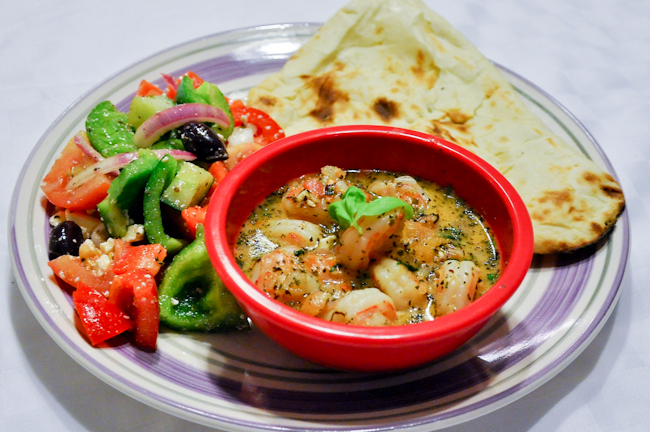 Other than pita, you can serve the shrimps with any crusty bread. I once served it with Naan bread before and it was really good too. You can pre-make the salad and refrigerate it up to 24 hours.